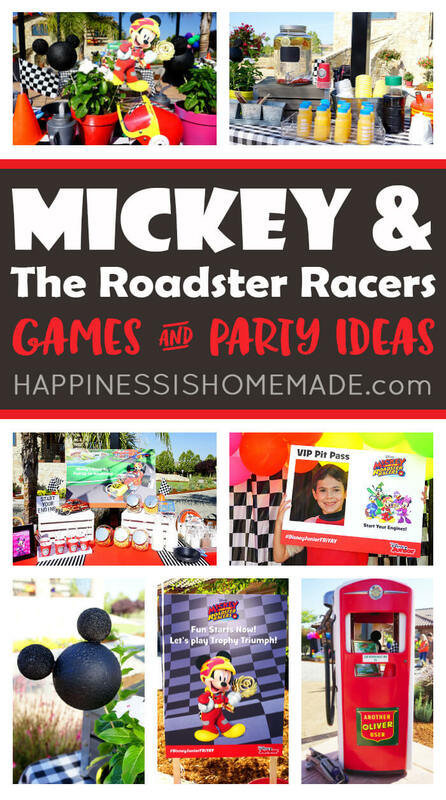 Looking for Mickey and the Roadster Racers games and party ideas? 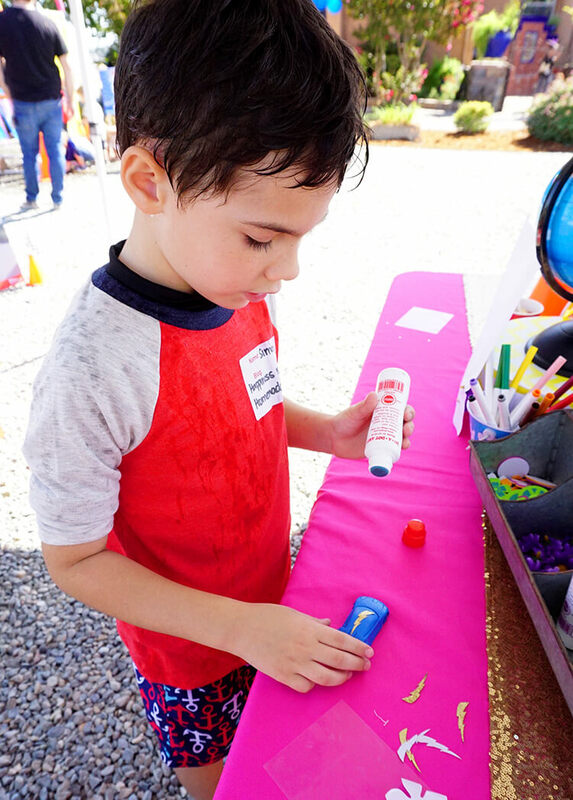 Check out these fun party games, printable party decorations, yummy food, kids crafts, party favors, and more from our friends at Disney Junior! My older boys recently rejoined the world of public school, so only my first-grader is at home doing homeschool with Mom these days. 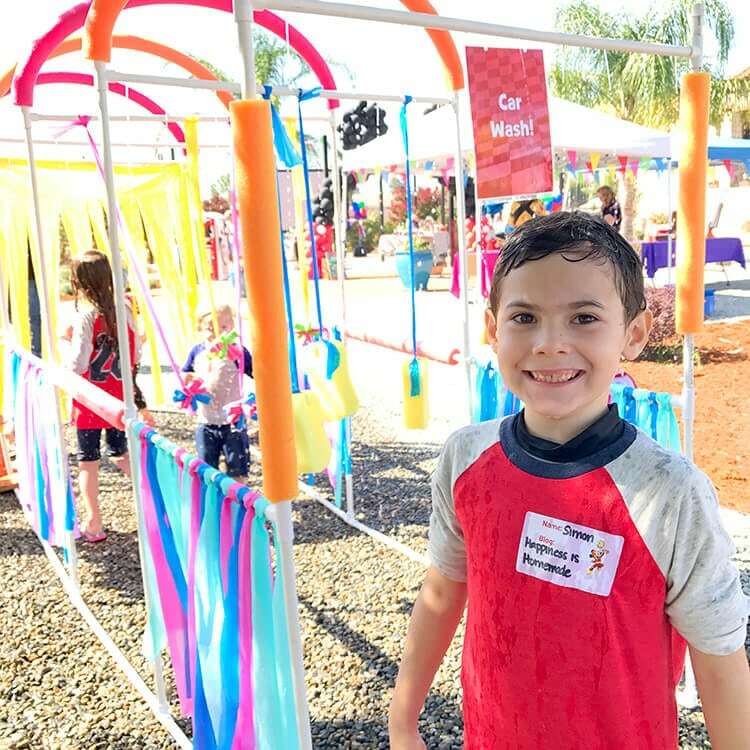 Since he’s already working above grade level, we don’t have a super rigorous work schedule, and one of our favorite new traditions is celebrating FRiYAY mornings with Disney Junior. 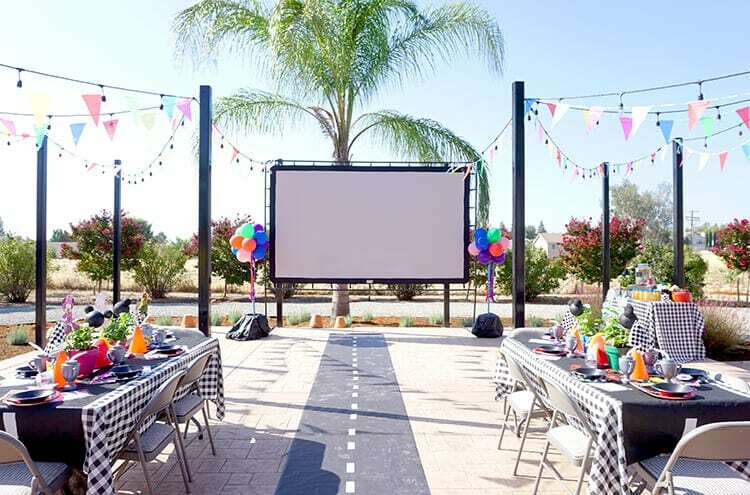 Every FRiYAY, Disney Junior shows new episodes of one or two of our favorite Disney Junior Shows – Mickey and the Roadster Racers, Puppy Dog Pals, Lion Guard, Sofia the First and Elena of Avalor (shown first on the Disney Channel from 6-10 am and then all day long on Disney Junior) along with other new content. Simon always has to make sure that he’s one of the first people to watch the new shows! 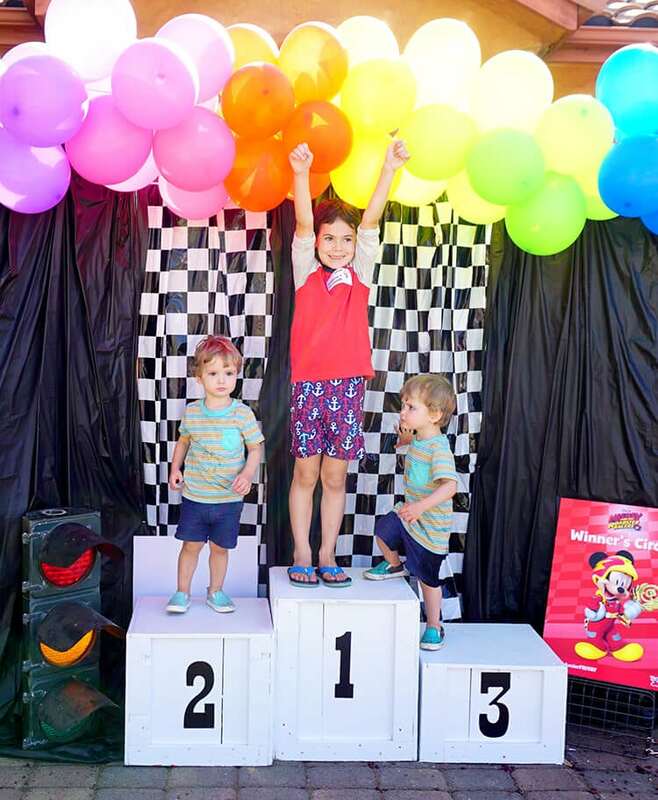 My little guy loves Mickey Mouse and Puppy Dog Pals the most, so he was beyond excited when he received an invitation to a super special sponsored Disney Junior FRiYAY party featuring Mickey and the Roadster Racers! 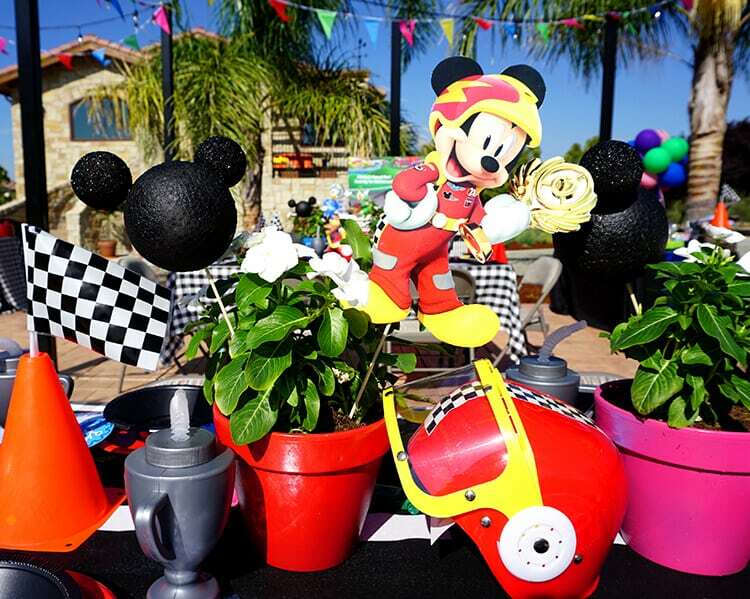 When Disney Junior hosts an event, they go all out, so if you’re looking for lots of awesome Mickey and the Roadster Racers games and party ideas, you’re in the right place! 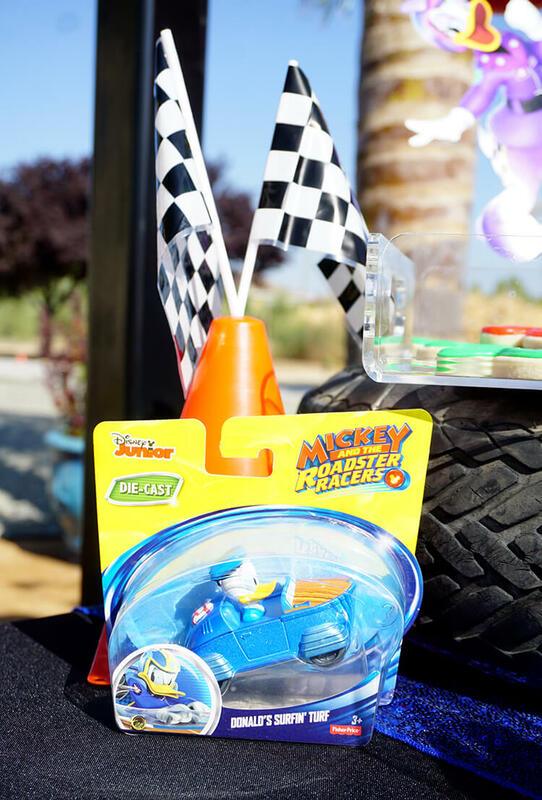 First, we joined up online with Disney Junior for their #DisneyJuniorFRiYAY Twitter party and then continued the fun offline at a Mickey and the Roadster Racers themed bash! 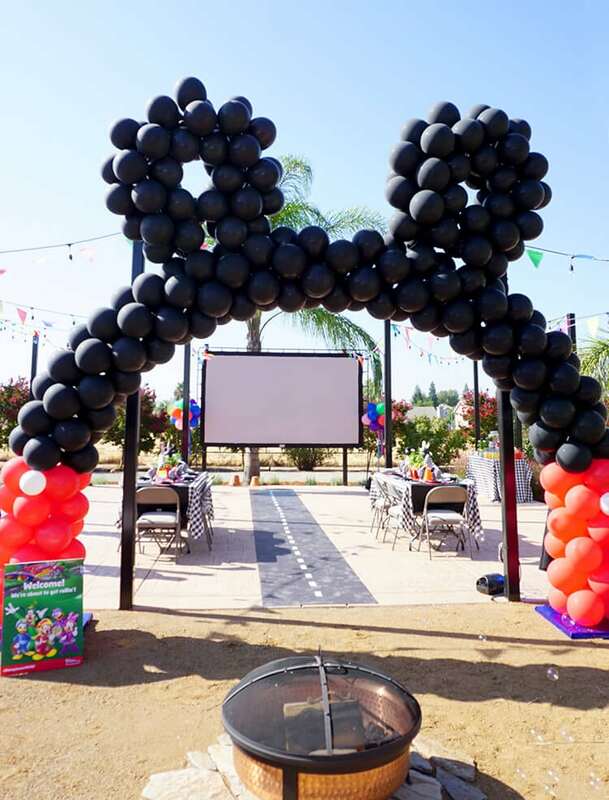 We were welcomed by a ginormous Mickey-themed balloon arch that framed the entrance to the party tables, food displays, and a huge outdoor screen – perfect for showing those new episodes during Disney Junior FRiYAY! The kids got a huge kick out of the raceway runway down the center aisle, and there were lots of impromptu races held all morning along this track! 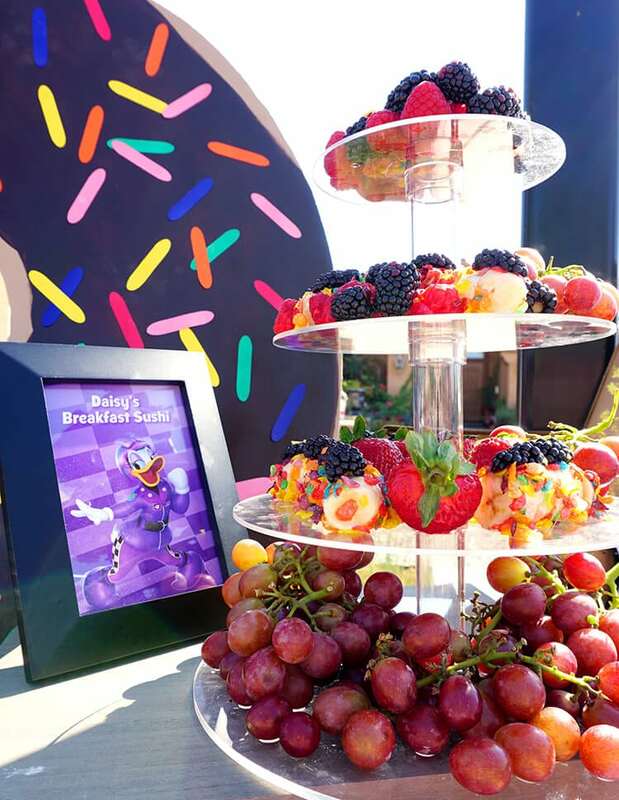 The Disney Junior FRiYAY party was held in the morning, so the foods served consisted of lots of creatively-themed delicious breakfast foods. 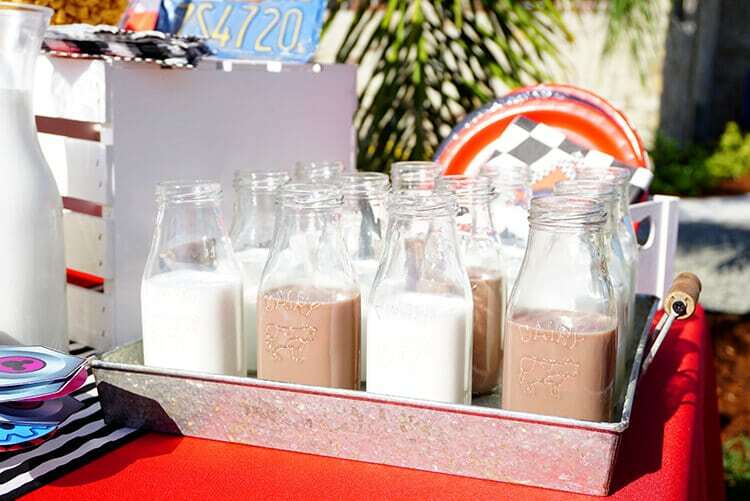 Mickey’s Cereal Bar offered five different types of cereals along with Minnie’s Cereal and Yogurt Parfaits (fresh fruit was also available on another table if the kids wanted to add it to their cereal or yogurt). 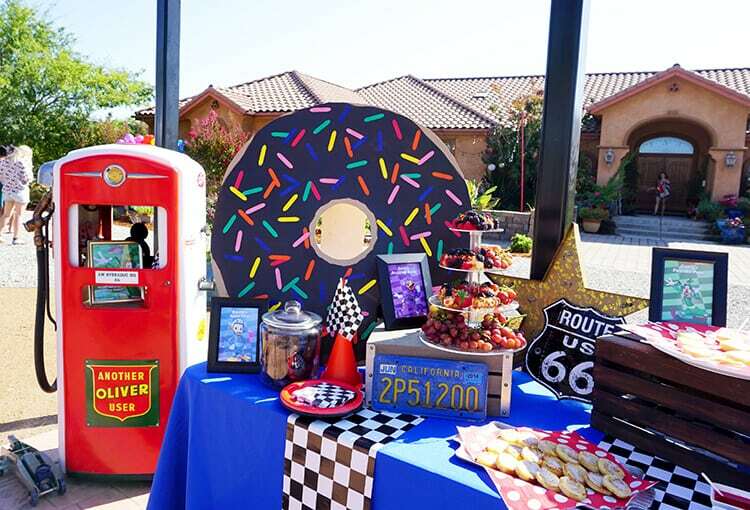 Donald’s Spare Tires (chocolate donuts) and Daisy’s Breakfast Sushi (bananas rolled in fruity cereal and topped with berries) were both VERY well received by the kids and adults alike. Simon actually declared banana sushi as his new favorite food! Goofy’s Pancake Pops were served with an assortment of dipping sauces (maple syrup, strawberry sauce, chocolate syrup, and Nutella). 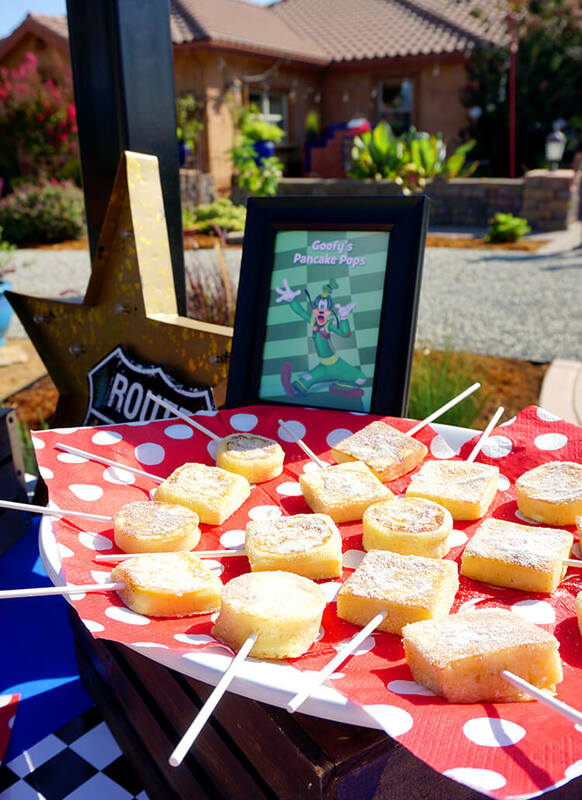 You really can’t go wrong with fluffy pancakes on a stick, and the kids absolutely loved these, too! 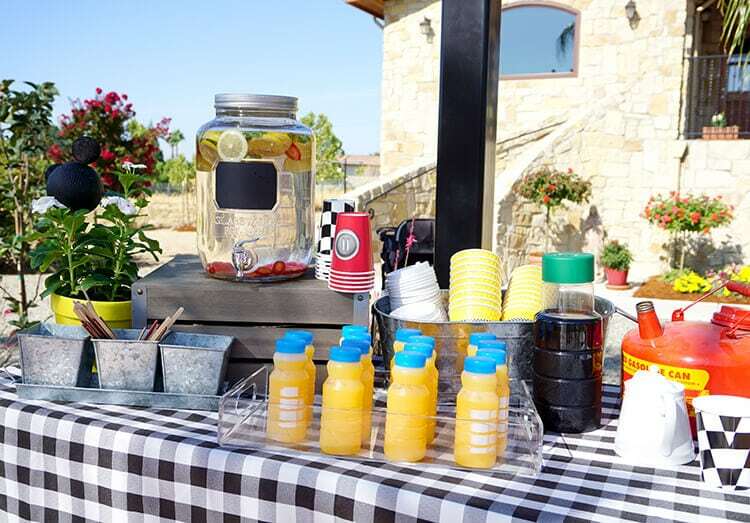 A fully-stocked beverage bar served up coffee, fruit-infused water, and juices. Perfectly done! 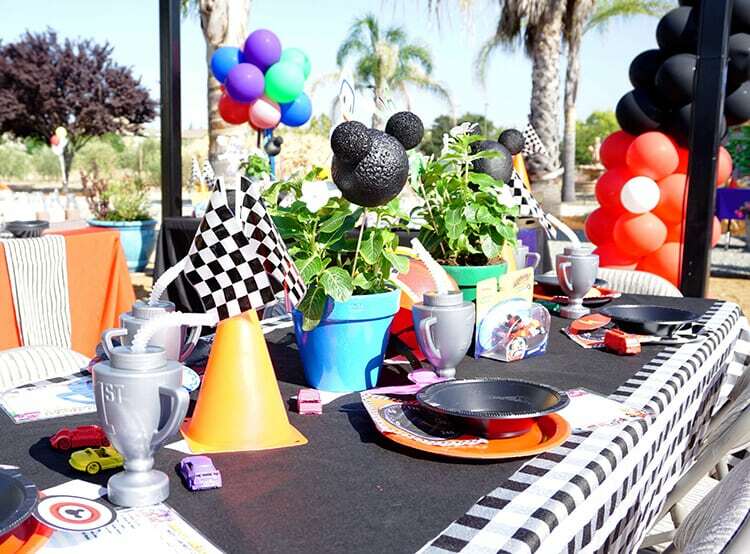 The kids’ dining tables were covered with black and white checkered tablecloths topped with a black paper runner and lots of Mickey and the Roadster Racers goodies – small race cars, trophy cups, caution cones, checkered flags, and packaged Mickey and the Roadster Racers die cast characters and vehicles that also served as party favors. 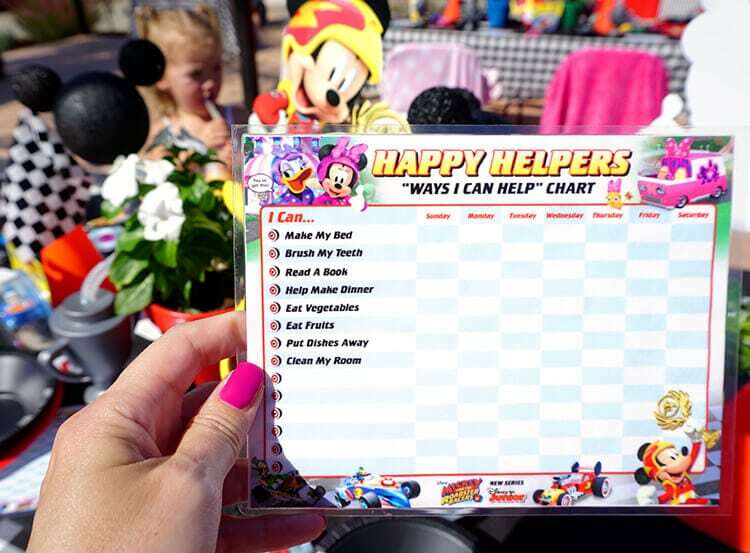 These cute “Happy Helpers” charts can be printed from the Disney Junior website. I love the idea of laminating it so that it can be reused over and over again! 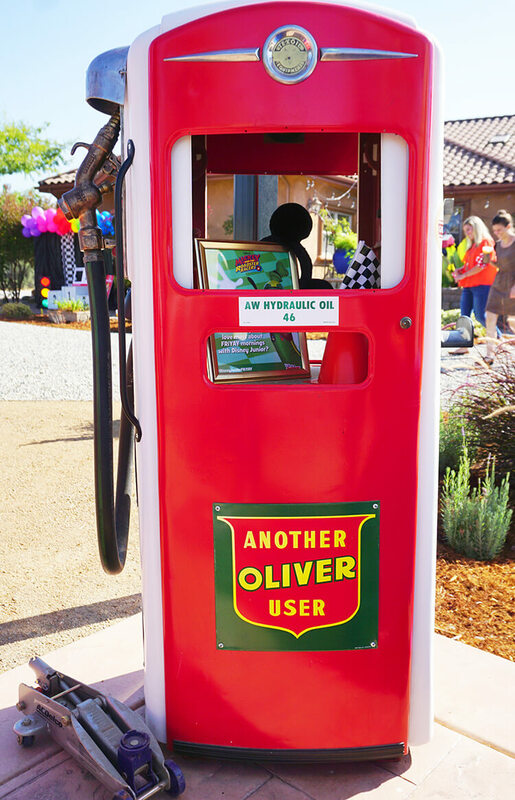 This gas pump was a great addition to the party theme and atmosphere, and it was one of many party props that made for a great photo opportunity spot! 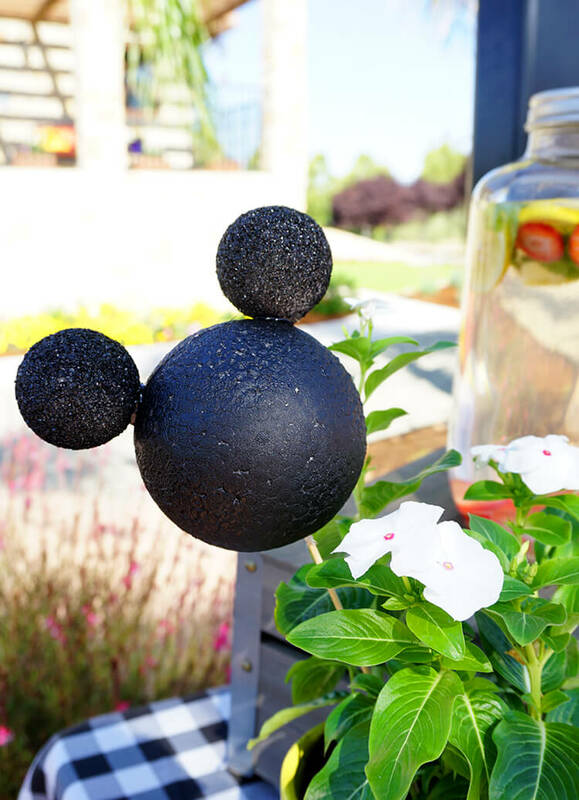 These styrofoam Mickey head plant picks are so simple to make, but they lend a lot of character and charm to the setting! 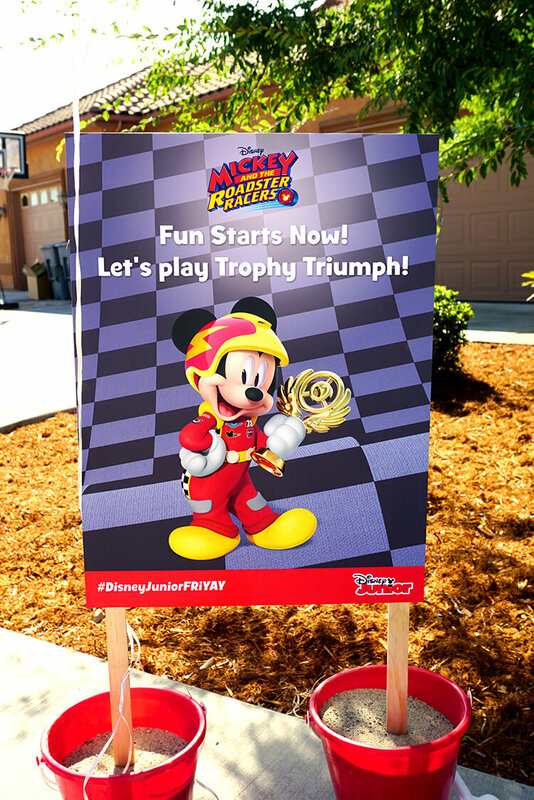 Trophy Triumph is one of the fun Mickey and the Roadster Racers themed games that is available on the Disney Junior Website, and Disney Junior super-sized it to create a kid-sized version of the game for this party! 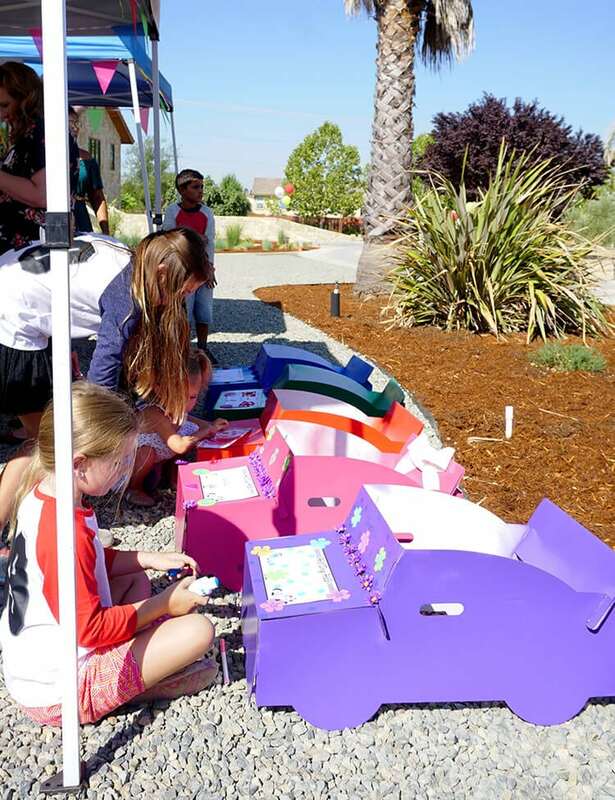 Just like the printable version of the game, children roll the (giant inflatable!) dice to move forward or backward and complete tasks depending on which characters they land on. 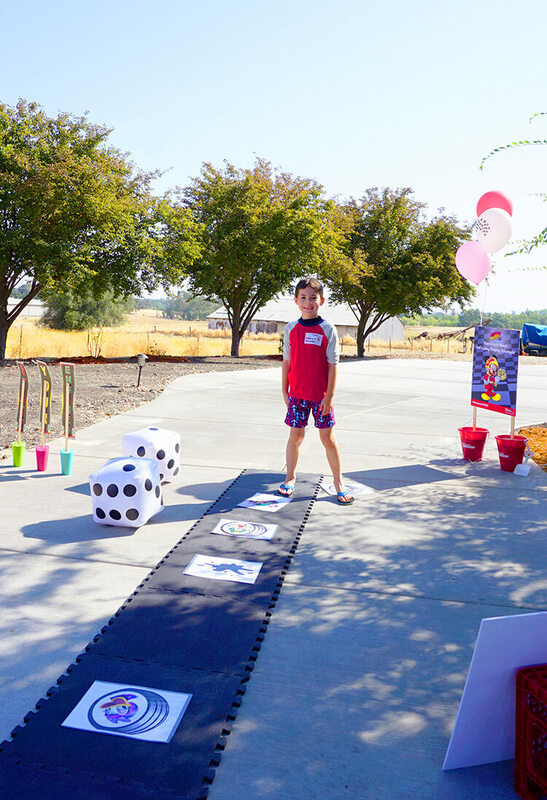 The kids had a blast with this game, and I thought that the idea of creating a kid-sized board game was a ton of fun! 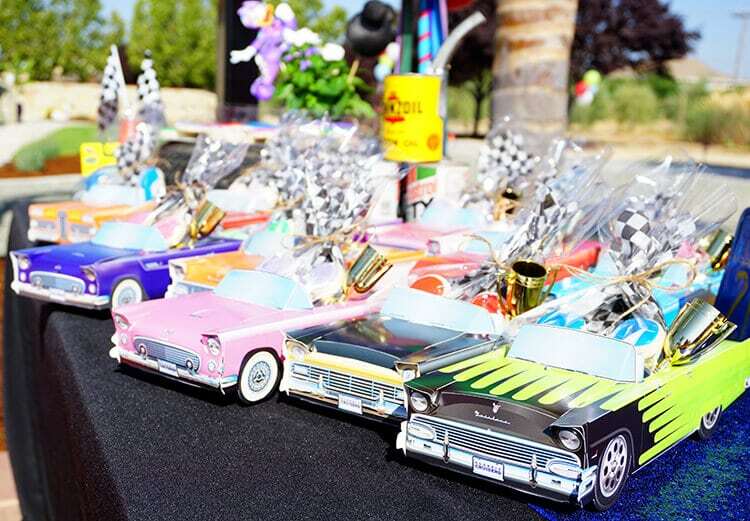 At the crafting station, the children decorated their own die cast race cars and then worked together to decorate colorful cardboard cars to “race” as game pieces in the Trophy Triumph board game. 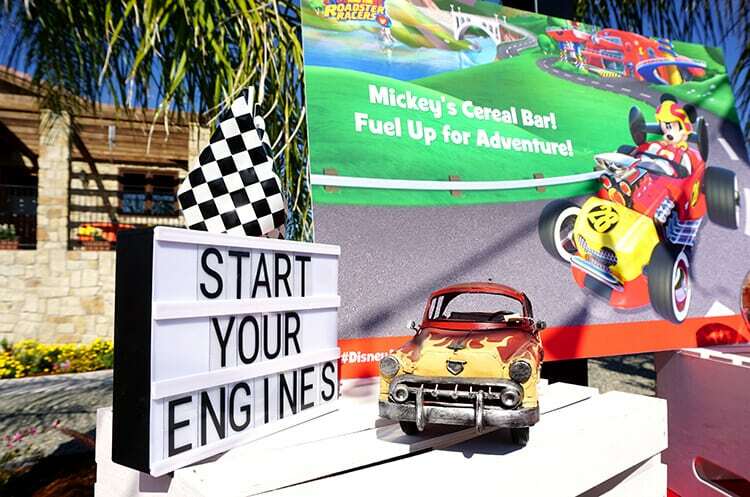 You can find the directions for making these cardboard cars along with the printable license plates on the Disney Junior website – there are TONS of fun Mickey and the Roadster Racers ideas and activities on there! 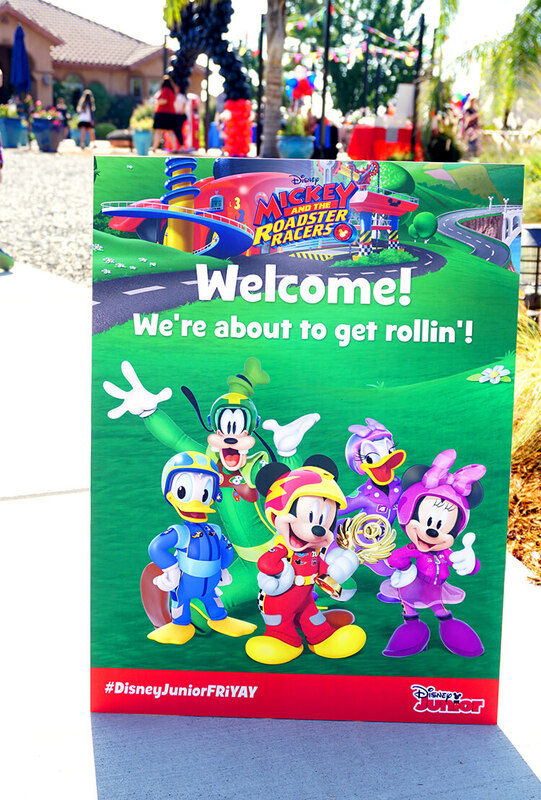 On the Disney Junior website, you can also find even more party printables to make your Mickey and the Roadster Racers party the best ever – printable banners, juice box wraps, snack signs, Mickey racing ears, coloring pages, and MORE! 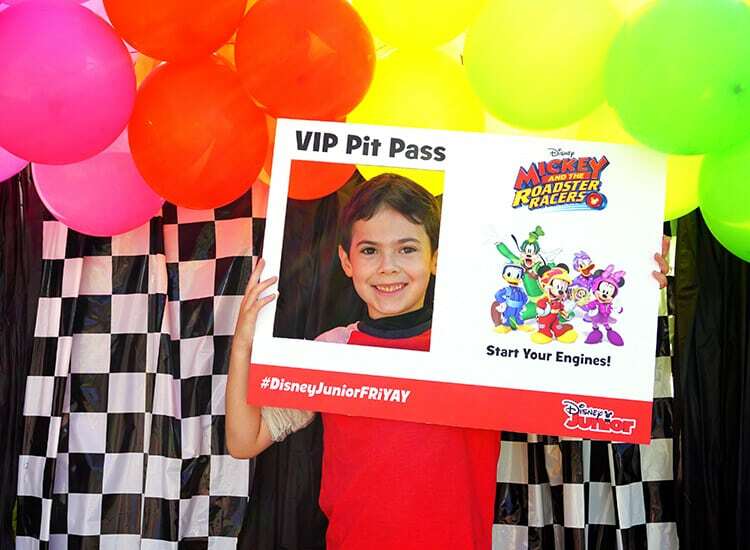 We made sure to stop by the photo area to get our VIP Pit Pass before hitting the races! After a full morning of crafting, eating, and racing, it was time to cool down in the car wash! 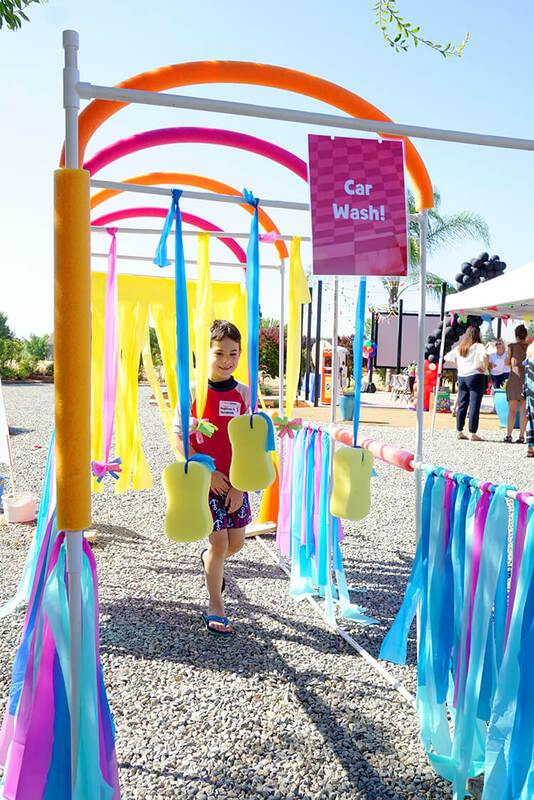 This fun PVC sprinkler “car wash” was one of the highlights of the party, especially after running around on a hot summer day! 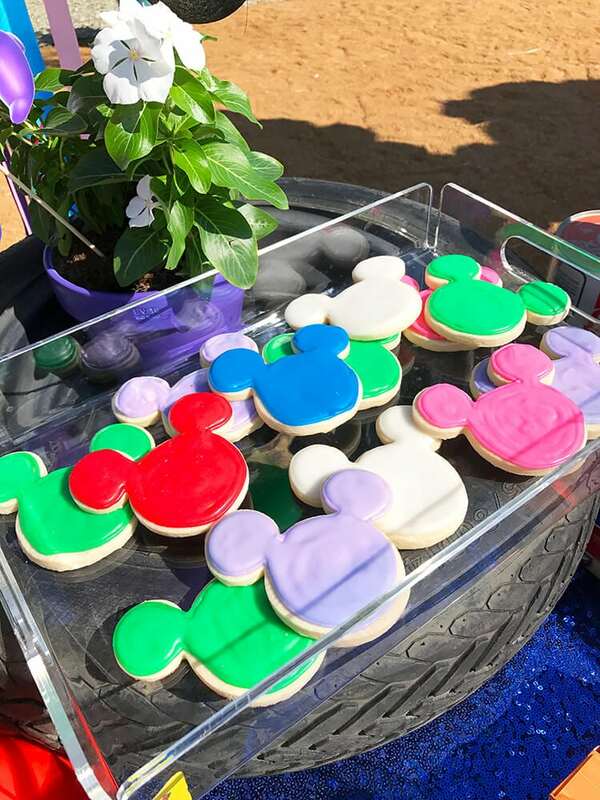 After an incredible morning of fun, it was time to say goodbye, and these colorful Mickey cookies were just one of the awesome things that were tucked inside of our car-shaped favor boxes. 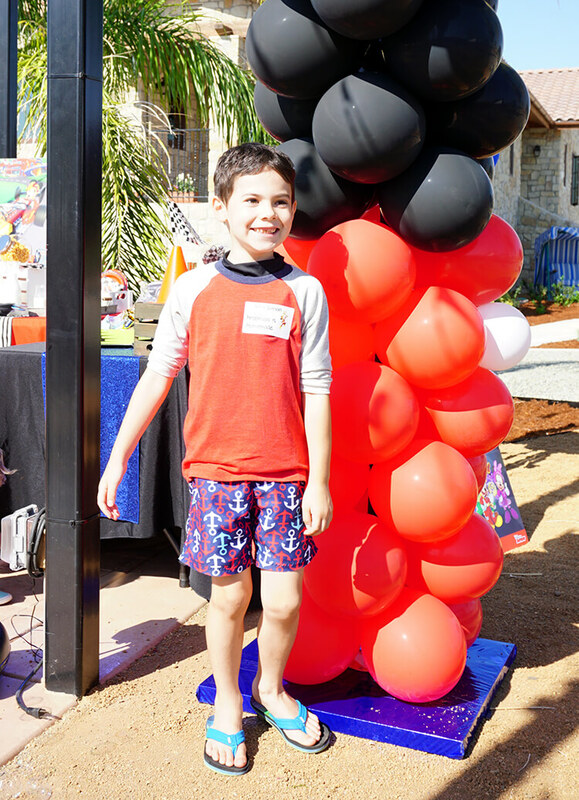 When it was time to leave, Simon kept telling me how sad he was that the party had to end, saying, “This was the best day EVER! I wish it never had to end!” We had a fantastic and memorable day, and I am sure that we will be talking about it for a very long time! 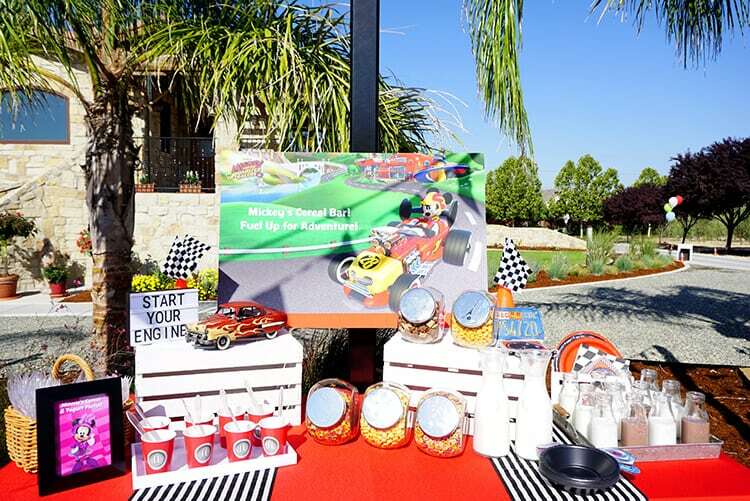 If you like these Mickey and the Roadster Racers Party Ideas, Don’t Forget to Pin ’em! How did you do the VIP pit pass?